Q. What are the major features of WINDS? 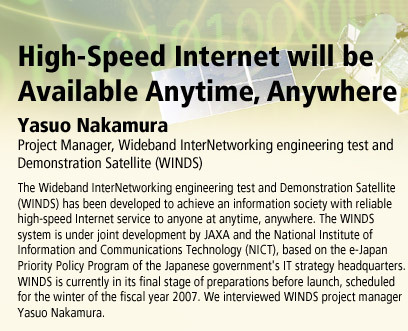 WINDS' primary features are ultra-high-speed Internet communication capability and wide coverage. High-speed communication can be achieved with smaller-than-conventional user terminals. The WINDS communication system is designed for a maximum down link rate of 155 Mbps with a 45-centimeter aperture antenna for home use, which is faster than commercial optical fiber, and ultra-high-speed 1.2 Gbps data communications with a five-meter antenna for business users. 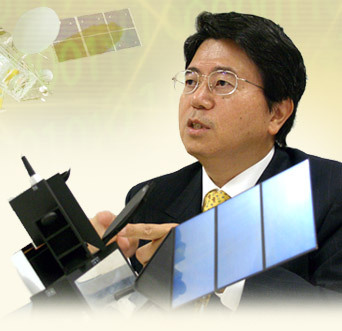 WINDS is a geostationary satellite stationed above Japan at an altitude of 36,000 km, and can cover one third of the globe. Another notable feature of WINDS is its onboard Asynchronous Transfer Mode (ATM) switch, developed by NICT. The device will rapidly sort uplink signals by destination address and beam downlink signals directly to the correct addresses. In conventional satellite-based communications, signals received by satellite have to be transmitted to the ground for sorting of destination addresses and then resent to the satellite for distribution. With WINDS's onboard switch, communication delay will be reduced and resource utilization of the satellite will be improved. WINDS's ATM is the fastest among all satellite-based ATMs. Satellite-based communications are essentially robust against disaster. Even if communication networks are disrupted and electricity lines are down, an Internet connection can be easily set up anywhere, with a 45-centimeter-antenna user terminal. WINDS will be able to link up with communication networks on the ground and promptly deliver disaster information. Given these advantages, the purpose of WINDS is to develop and demonstrate technology to establish the world's most advanced information society. After launch, we will verify and demonstrate the new technology through engineering and application experiments. WINDS will help establish reliable advanced Internet communications, and build a truly interconnected society. Q. What kind of communication devices will WINDS be equipped with? WINDS uses Ka-band frequency radio waves, which have a frequency range of about 20 to 30 GHz. These high-frequency radio waves are suitable for large-capacity communications, but their power is diminished by rain, which means that communications quality is degraded in rainy areas. Although the quality can be improved by boosting the radio-wave power, this requires a lot of electricity. And since electricity for a satellite is generated by solar array paddles, it is a limited resource. It was a critical challenge to find the most efficient means of allocating this limited power supply. In the end, we equipped WINDS with a Multi-Port Amplifier (MPA) that can flexibly assign transmission beams as needed: it will allocate power efficiently by sending a stronger signal to a rainy region, and a weaker signal to a sunny region. WINDS also has two Multi Beam Antennas (MBAs) with fixed radio-wave directions to be combined with the MPA. One antenna covers Japan using nine fixed beams; the other covers ten other Asian cities, including Manila, Bangkok and Singapore. Another onboard device is an Active Phased Array Antenna (APAA) for establishing ultra-high-speed communications in wide areas. The APAA can change the beam direction flexibly and rapidly. With this ability, the APAA will enable Internet communications in regions that the multi-beam antennas cannot cover. 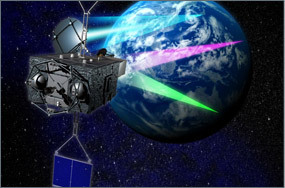 By instantly shifting a beam within the sightline of WINDS in its geostationary orbit, from Hawaii to Oceania for example, the APAA is capable of providing Internet communications to about one third of the Earth. WINDS communication systems using Ka-band frequency are cutting-edge technology.